Erasmus: Don’t be so reserved. I have become yours so completely that nothing of myself is left...I have wooed you both unhappily and relentlessly. Roger: What is wrong with you? This portrait of Erasmus by Hans Holbein the Younger (1523) hangs in London's National Gallery. While later teaching in Paris, Erasmus instructed a 21-year-old English-born student, Thomas Grey, who later became Marquis of Dorset. Erasmus was abruptly dismissed as Grey’s teacher, for making unwanted advances towards him. It seems Erasmus had a thing for straight men. 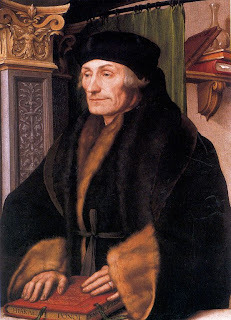 Erasmus was born Gerrit Gerritszoon (Dutch for Gerard Gerardson) in Rotterdam as the illegitimate son of a physician's daughter and a man who later became a monk. On his parents' death his guardians insisted he enter a monastery, where he adopted the name Desiderius Erasmus. After taking priest's orders, Erasmus went to Paris, where he earned a living as a teacher. His life-long clashes with theologians and clergy took root while in France. Among his pupils was English Lord Mountjoy, who invited Erasmus to visit England in 1498. He lived chiefly at Oxford, and through the influence of John Colet, his contempt for theologians was heightened. He returned to Paris and later made a much longed for trip to Italy, but returned to England from time to time. While residing at Cambridge Erasmus served as professor of Divinity and Greek. In 1519 the first edition of Colloquia appeared. Usually regarded as his masterpiece, Colloquia critiqued the abuses of the Church with audacity and incisiveness, preparing men's minds for the subsequent work of Martin Luther. In future works Erasmus promoted a more rational conception of Christian doctrine, emancipating men's minds from the frivolous and pedantic methods of contemporary theologians. Members of the clerical establishment became his sworn enemies, driving him to live out the rest of his days in Basel, Switzerland. Fortunately, during his last years Erasmus enjoyed great fame, fortune and high regard. Erasmus stands as the supreme example of cultivated common sense being applied to human affairs. He rescued theology from the pedantries of theologians, exposed the abuses of the Church, and did more than any other single person to advance the Revival of Learning. A popular European student exchange program, established in 1987, is named after him. The Erasmus Programme is a major European Union higher education initiative; there are currently more than 4,000 higher education institutions participating in 33 countries, and more than 2.2 million students have already taken part.